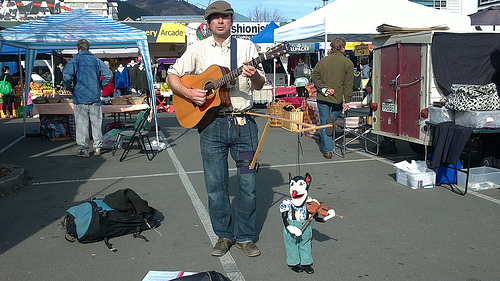 Maybe it was the wistfulness of the busker’s song or his cheerful puppet, stirring old childhood memories. Nowadays, it’s the random things that move me. Kinda ridiculous but there you are. Made a great photo though. We arrived at Nelson’s CBD at 10.00am and it was humming – a massive carpark full of shoppers looking for quality goods, conversation and the spice of gossip. 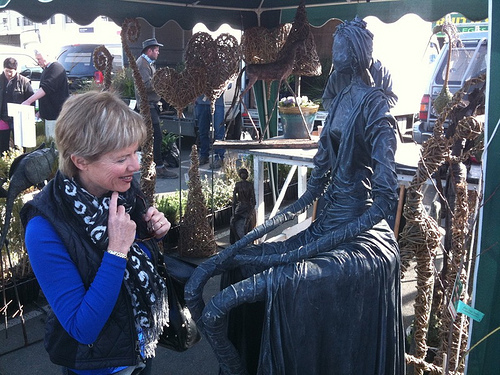 The thing I absolutely love about New Zealand outdoor markets is that it tends to attract likeminded people. It’s the camaraderie within a market community that appeals. You can start a conversation with a total stranger and unlike some overseas markets, the vendors aren’t pushy – they’re just happy you’re interested in their product and artwork. You needn’t feel the awkwardness of walking away without buying anything – I’ll remember their nice attitude and will be returning very soon – maybe to buy that stunning candelabra. Yep, that’s how it works folks. 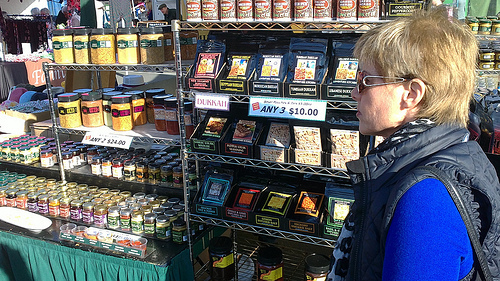 …and it’s not just Kiwi accents you’ll hear you’ll hear at New Zealand outdoor markets. There’s a smattering of Italian, Germans selling Schwarzwaelder Schinken (thinly sliced smoked ham) and that darn ‘bung-up-the-pipes’ bread. On Saturday, one stallholder tried to give me a cooking lesson on how to cook floury Agria potatoes. Me, the cheek of him! 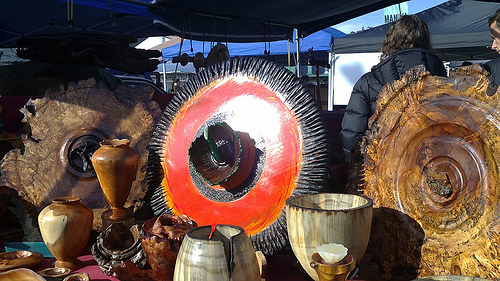 Gotta tellya about the most amazing woodturning craftwork at the Nelson market and hope the above photo gives you some idea of the artisan skill involved. I wanted to buy and buy but was gently guided away by concerned hubby back to the bread and spuds. Sometimes that man is too practical. Hi Elaine, nice to hear from another fan of this fabulous market. We have totally fallen in love with the Smokehouse products. Also there’s a great stall advertising classes for outdoor artwork and sculptures.